As I write my flashbacks to ARIA charts from years past, I sometimes come across songs I didn't know at the time. Often, it's an obscure track that didn't make the top 50, or a song from when I was only eight or nine years old and hadn't yet become such a chart obsessive. The new entries on the singles chart from this week in 1983 provide a first for me. Even though I'm familiar with most of the artists behind the songs (seven new entries outside the top 50 and two debuts on the top 50 itself), I'd only ever heard one of the tracks prior to sitting down to write this post - and I only heard that for the first time a couple of years ago. So, I'm going to do things a little differently this week. I'll give my first impressions of each song. Do I like it? Should it have been a hit? Then, I'll fill you in on the story behind each single as usual. Exciting, right? A single I'm all too familiar with registered a fourth week at number 1 this week in 1983. "Australiana" by Austen Tayshus triumphed yet again over a surprisingly resilient "Flashdance... What A Feelng" to claim the title of highest selling record in the country. First impression: European, surely? If ABBA couldn't cut it with this kind of Europop in the early '80s, what hope did Audrey Landers have? It's OK, I guess, but the verses seem to last forever and the chorus sounds like it's from a song that gets knocked out at the semi-final stage of Eurovision. The facts: She might have been an American actress, starring in Dallas at this point in time, but Audrey's first single of the '80s enjoyed most of its success on the Continent, where it hit the top 10 in a handful of countries. First impression: I'm familiar with "One Thing Leads To Another" from later in 1983, but this earlier single lacks that same big hook. I like the feel of it, but it doesn't scream hit to me. The facts: Well, it was a top 20 hit in the US, but "One Thing..." did much better, reaching the top 5. "Saved By Zero" was the lead single from the band's second album, Reach The Beach, and is about getting back to basics in a Buddhist kind of way. First impression: Obviously I know who Divinyls are, but "Casual Encounter" is one of those between-hits singles that's passed me by until now despite the fact that I own Greatest Hits on which the song appears. I like the bridge (or pre-chorus or whatever it is), but the chorus doesn't really go anywhere. The facts: The fourth and final single from the band's debut studio album, Desperate, "Casual Encounter" was the first to miss the top 50. First impression: This is the song I've been most interested to hear since I was a big fan of ABBA-mate Frida's solo hit, "I Know There's Something Going On", from 12 months earlier, but I'd never heard (or bothered to search out) Agnetha's solo efforts from the same era. "Can't Shake Loose" sounds like something Physical-era Olivia Newton-John might have released and has a pretty decent chorus, so I'm not sure why it didn't perform better on the chart. 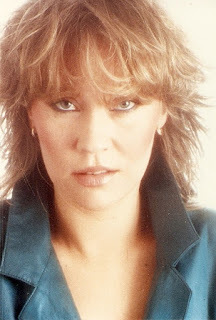 The facts: This was Agnetha's only solo single to reach the top 100 in Australia, and was actually the third track lifted from her first post-ABBA solo album, Wrap Your Arms Around Me. "Can't Shake Loose" was written by Russ Ballard, who also penned Frida's "I Know There's...". First impression: This is the song I've heard before - but only in the past couple of years. I'm puzzled why it didn't cross over in Australia in a Falco/Nena kind of way. The facts: "Major Tom (Coming Home)" is the English version of synthpop act Peter Schilling's German chart-topper, "Major Tom (Völlig Losgelöst)". Lyrically, it's a sequel to David Bowie's "Space Oddity", even though that ground had been covered in "Ashes To Ashes". First impression: Like "Face To Face", which I discovered when it popped up in my 30 Years Ago... posts covering 1985, this single from the Australian synthpop band is not bad at all. At the same time, I can see why it wasn't anywhere near as big as the singles either side of it, "Send Me An Angel" and "Catch Me I'm Falling". 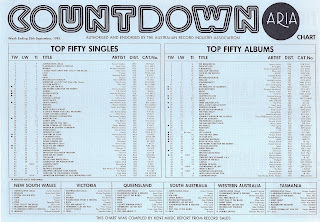 The facts: This second single from Heartland liked the number 72 position - it spent three non-consecutive weeks there. First impression: I'm not opposed to a bit of Dolly, especially when it's at the poppier end of the spectrum like this. "Potential New Boyfriend" doesn't blow me away, but I wouldn't turn it off if it came on the radio (if I listened to the radio, that is). The facts: The only single from her Burlap & Satin album, "Potential New Boyfriend" was Dolly's first top 100 appearance since a re-recorded version of "I Will Always Love You" (from The Best Little Whorehouse In Texas) made number 72 in the last week of 1982. The song was accompanied by her first ever music video and ended up hanging around the top 100 for 18 weeks, no doubt thanks to the success of "Islands In The Stream", which we'll see arrive on the top 50 in a few weeks. First impression: This made the top 50 when some of those other songs didn't? Actually, it makes sense. "Whatever Happened To Old Fashioned Love" is the type of sentimental pop/country tune that sometimes found an audience in Australia in the early '80s. It's got an incredibly catchy chorus that I'm sure will be stuck in my head for hours now - and it was performed by a singer with chart pedigree, even if it's nowhere near as good as the best thing he ever recorded. The facts: BJ Thomas topped the Australian chart way back in 1966 with his second single, "Mama" and had enjoyed a number of local hits over the years since then, including the original version of "Raindrops Keep Fallin' On My Head" that was on the chart at the same time as John(ny) Farnham's number 1 remake. The first single from BJ's New Looks album, "Whatever Happened..." was his biggest hit in the US since the late '70s and, although only a minor hit on the ARIA chart, it then spent many weeks hovering outside the top 50, eventually racking up 25 weeks on the top 100. First impression: Oh, this sounds familiar. I'm sure I've heard this played in the background of something or other over the years - probably an '80s variety or daytime talk show - but I've never known what it was called. Are there vocals or is it just an instrumental track? (A minute and a half later) With the exception of some brief backing vocals, it's an instrumental it would seem. I can see why this was popular. The hook is immediately memorable, but I can also see why it didn't get any further than number 32. (A minute later) OK, I'm kind of bored of it now. The facts: Mezzoforte are from Iceland - I never would've picked that. "Garden Party" had been a top 20 hit in the UK in March, and both it and album Surprise Surprise were the jazz-funk band's only appearances on their respective ARIA charts. Herb Alpert recorded a version of it, apparently. 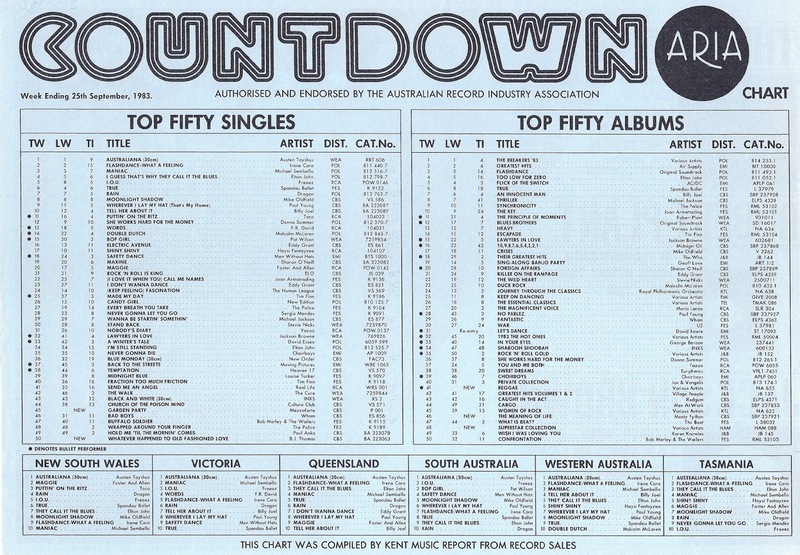 Next week: eight new songs debut on the top 50, including the single that would knock Austen Tayshus from the number 1 spot, a comeback from a hit disco group and a cover version by an Australian band about a city in Jamaica. And, a couple of releases I don't recall from 1983. In case you didn't know, Potential New Boyfriend is a cover of a song released the previous year by Australia's own Doug Parkinson. I know this because Doug's original version is on one of those 80's compilation albums. I didn't know that. Doug's version reached number 97 in October 1982 so no surprise it passed me by. Thanks for the tip! The Audrey Landers song sounds like it could have been a Eurovision entry. The Agnetha song is OK, but I prefer Frida's 'I Know There's Something Going On'. 'Openhearted' is OK musically, but the vocals aren't the best. It doesn't even sound like the same singer. I thought I knew the Dolly Parton song, and my memory of the chorus was correct, but the verses are completely different to how I remembered it. I'm sure I'll be proven wrong when you cover 1984, but 1983, to me, seems like it was the last year that totally mushy, dated-sounding 'mumsy' music could make an impact on our charts; the BJ Thomas song being an example of what I mean. I would've thought Björk was the first Icelandic artist to conquer our chart. Check out the compilation "1982 The Winners" for the Doug Parkinson version of 'Potential New (Girl)friend' (the one with the pool water on the front). July 1983 was when I started listening to the charts (on 3XY), so a lot of these songs are still memorable to me, and I have always loved Mezzoforte's "Garden Party", even the later remixes of the track over the years. The only one of these unfamiliar songs that wasn't also unfamiliar to me is the BJ Thomas one, which I liked at the time, and which got a fair amount of airplay. It's sentimental for sure, but I do tend to like that!